Poha can mix as well as cook! 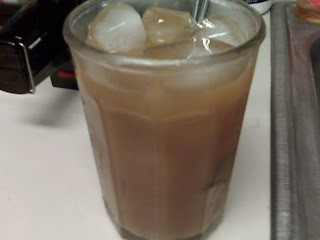 Kahlua (yes, the coffee liquor) and orange juice make a seriously tasty liquid Tootsie Roll (an American chocolatey taffy type candy). I promise! Have I steered you wrong? C'mon.... 1 ounce Kahlua over ice, top with OJ, stir. Or shake. My cup is a little too big for a shaker :D a straw is a nice garnish for this lovely beverage.